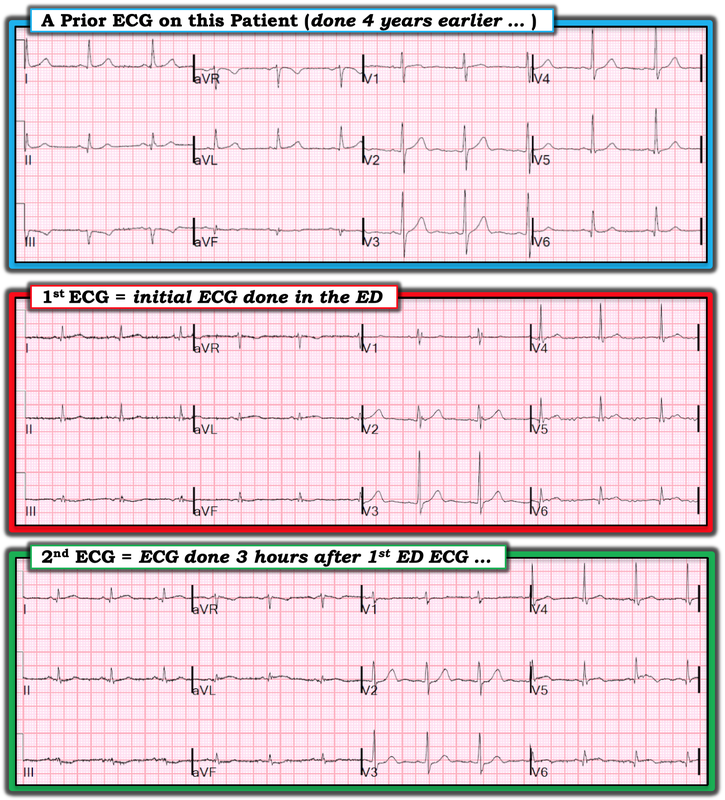 Dr. Smith's ECG Blog: Should Troponin be a Vital Sign? Perhaps, but only if Interpreted Using Pre-test Probability. "Troponin found to be elevated to 27. Patient denied chest pain on initial review of symptoms. Was now endorsing chest pain which began 30 minutes ago. Upon further questioning, he states that he has had intermittent chest pain since yesterday. Pain worsens when lying flat and improves with sitting up. Given 324 mg aspirin. Repeat ECG shows modest ST elevation in I and aVL and depression in inferior leads." There are many, cardiologists especially, who think that Emergency Physicians order too many troponins. Many come back "positive" and trigger many often unnecessary downstream tests. 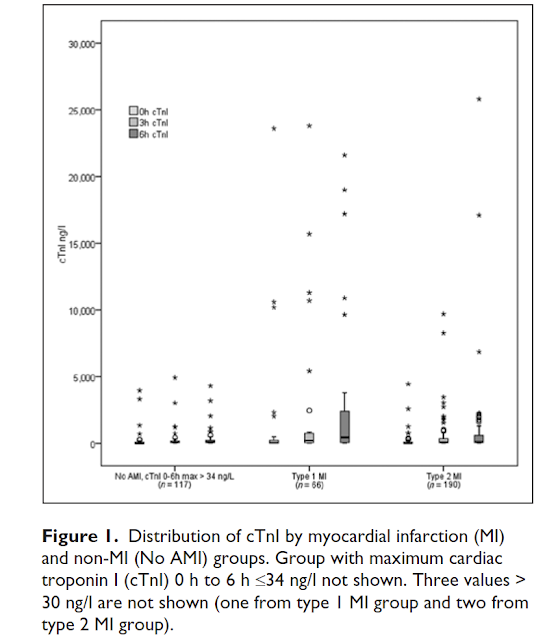 In our UTROPIA study (NCT02060760), from which there are many publications, 85% of "positive" troponins (at least one value above the 99th %-ile upper reference limit (URL), were either type II MI or non-MI myocardial injury (acute or chronic myocardial injury). If the patient has a low pretest probability and the ST elevation or T-wave is not clearly diagnostic, then don't call it OMI without further testing. If the presentation for MI is classic, then the highly suggestive ST-T has a much higher post-test probability. Lack of a long lead II rhythm strip, baseline artifact and very low amplitude atrial activity all contribute to making rhythm assessment of the 1st ECG quite challenging. That said — a low atrial rhythm clearly appears to be present. Clinically — the clinical significance of a transient, non-accelerated low atrial rhythm is minimal. Our THANKS again to Dr. Smith for presenting this case. In such situations set the ECG device to 20 mm/mV (or even more, if available) and record again. Great case with excellent comments and an especially good example of an OMI without STEMI (or rather, without STE that meets STEMI criteria). I would be very suspicious that the first ECG had a LA/LL lead wire switch. This is the first thing that goes through my mind when I notice that Lead II does not have the largest upright P wave. While the P waves normalized with the 2nd ECG that was performed, there were also subtle changes in Lead III (the QRS in III is reversed in such an exchange and this is reflected in the first two tracings in the ED). And there are also probably subtle differences in aVL and aVF, which would have been switched in an LA/LL exchange. The sinus rate after "conversion" to sinus rhythm is also slower than the rate of the "low atrial" rhythm that would have had to usurp the sinus rhythm; in other words, a FASTER "lower atrial" rhythm was usurped by a SLOWER sinus rhythm.